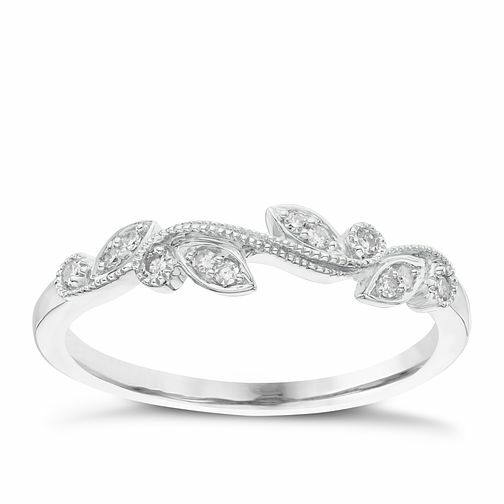 In a stunning vintage inspired floral design, this 9ct white gold ring features dazzling diamonds. A unique ring, perfect as a symbol of love, or a statement piece. 9ct White Gold Diamond Ring is rated 4.0 out of 5 by 1. Rated 4 out of 5 by Anonymous from Beautiful and delicate ring! Choose this ring as it isn't a traditional looking wedding band. Love the vintage design and isn't too 'in your face'. Very delicate and pretty. Can't wait to wear it after the wedding! !